Here is another creation that I saw in InStyle magazine last year. Firstly the concept of Matte nail polish was foreign to me. In all my years of being exposed to nail polish the concept was in total contrast to the purpose of top coat. To shine, seal and deliver the new look of the mani, not to dull it down and make it look like chalk. So when I saw this black mani showcasing both finishes, I had to try it. I call it Best of Both Worlds because it shows both finishes together beautifully. Thoughts? Feelings? Concerns? 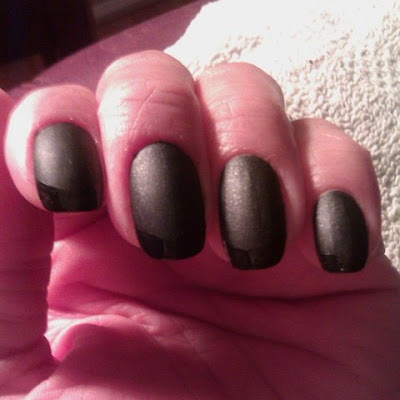 Nicole "Razzler Dazzler Matte" and Seche Vete topcoat on tips. The only thing with this mani is you have to be careful when applying lotion to your hands. It takes away from the intense contrast of the finishes by moisturizing the matte polish. A suggestion would be to add an actual matte topcoat first and then add the SV to the tips.